LOADING INSTRUCTIONS Note: To bypass the opening scenes, press the joystick button to go directly to the village map. To abort any event, whether competing or practicing, press [RUN/STOP] and the [RESTORE]. The menu will automatically be reloaded from the cassette. To practice an event highlight the appropiate game event icon on the village map. Press the [SPACEBAR] (or joystick button) to practice that event again. Select YES to return to the same event. Selecting NO will return you to the village map. Highlight this option and press the joystick button to replay the opening sequence. Press the joystick button to return to the village map, or wait for all the credits to appear after which you will be returned to the village map automatically. Choosing this option allows you to compete in all eight events automatically. Follow the game play instructions as you compete in each event. Select this option and once again you will see the Village Map. Move the torch to the appropriate event icon. Pressing the joystick buton will select that event. You can choose as many or as few events as you wish. You will automatically taken in turn to compete in your selected events. Note: During an event pressing the RESTORE key will stop play and return you to the Village Map. After completing all the competitive events chosen, a screeb appears listing the medal winning countries. The FINAL STANDINGS screen shows you the name of each contestant; the number of gold, silver and bronze medals won, as well as total points scored. Gold = 5 pts., Silver = 3 pts., Bronze = 1 pt. Then the award ceremonies will start featuring the leading medal winning countries. 1. Type in the name of a contestant and then press RETURN. Use DELETE to delete the character off the cursor. 2. The screen shows you the flags of three of the 18 countries with the centre flag being displayed by the contestant's name. Move the joystick left or right to select your chosen country. Press the joystick button to hear the national anthem for the flag. 3. Press RETURN to enter the next contestant's name. 4. When you have finished entering all the contestants, press F7. When you select this option, you see the world records for all the events. Select this option to return to the village map. * Press the joystick button to pull back on the bow. * Press SPACE BAR (or press the joystick button). This brings up a close up window giving you the bow sight in relationship to the target. Compensate for the wind factor as indicated by the windsock. * When you're ready to release the arrow, press the SPACE BAR (or a joystick button). NOTE: After you shooy an arrow, a close up of the target appears, showing you where you shot your arrow. 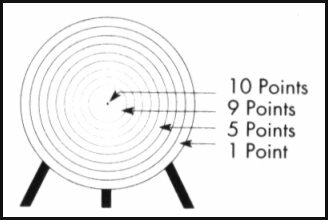 The illustration of the target describes the scoring. Arrows landing on the dividing line between the two colour zones earn the higher score. Failing to shoot all your arrows in the allotted time means that you will only score on the shots within the time. VELODROME CYCLING This event is a 1000 metres sprint; two riders starting on a 333,33 metre track. At the starting gun the competitors go slowly through the first two laps, jockeying for trailing position. Then at the sound of a bell marking the beginning of the third lap they break away and race to the finish. The first competitor across the line is the winner. You can choose to play either against the computer or a friend. You'll require a second joystick to compete against a friend. 1. The first screen asks you to decide between Tournament Play or Computer Opponent Play. Tournament Play requires two joysticks (bottom screen - joystick 1; top screen - joystick 2). Computer Opponent requires only one joystick (you will be using the top screen). For a one player game choose Computer Opponent and press the joystick button. 2. If you're in competition/tournament play, a screen gives you the names of the competitors and indicates which competitor will be racing next. Press SPACEBAR or a joystick button. The cyclist who finishes first in a single heat wins the race. However in the case of multiple player and computer opponent competitions, the time of the final lap is used as a tie breaker. Move the joystick up and then down to enter the water. Move joystick to the left until the diver enters the dive. Then pull the joystick down to enter the water. Move the joystick left and release just before the diver makes a complete somersault. Then pull the joystick down to enter the water. Mobe the joystick left at the same time press the joystick button. Then pull the joystick down to enter the water. Move the joystick up while pressing the joystick button but release after the diver completes a half twist. Then pull the joystick down to enter the water. Move the joystick right then pull down as the divber enters the dive. Then pull the joystick down to enter the water. Move the joystick right and release just before he diver makes a complete somersault. Then pull the joystick down to enter the water. Move the joystick right while pressing the joystick button. Then pull the joystick down to enter the water. Move the joystick up, then pull down to enter the water. Move the joystick left and release it just before the diver starts a somersault. Then pull the joystick down to enter the water. Move the joystick right releasing it just before the diver starts a somersault. Then pull the joystick down to enter the water. Quickly move the joystick left and release it just before the diver completes one revolution. Then quickly pull down to enter the water. Move the joystick right while pressing the joystick button. Then pull the joystick down to enter he water. Move the joystick down and quickly move it to the left while pressing the joystick button. Then pull the joystick down to enter the water. Press the joystick button at the same time that you move the joystick up. Then pull the joystick down to enter the water. Move the joystick right and release before the diver completes one revolution. Then pull the joystick down to enter the water. Try combining dives by quickly activating a second dive after you've started the first. For example, you can combine a back twist that changes into a back somersault by moving the joystick down, and then quickly moving it up at the same time that you press the joystick button. Then as the diver goes into his twist, quickly move the joystick to the left. It will take practice for you to get the coordination and timing to work well together. * Quality of dive execution. * The number of combinations in a single dive. * The height of a dive. * The quality of the diver's entry into the water. Press the joystick button to enter the spin phase at any time during the warm sequence. Increase the hammer travel during the spin phase by moving the joystick in a circular anticlockwise direction. Press the joystick button again to enter the revolve stage, where the competitor rotates his body as he revolves the hammer above his shoulders. When the competitor has reached his top spin speed, press the joystick button to release the hammer. The longest of three throws score. * Press the joystick button too late for the release and the hammer will make a hole in the fence. * Press the joystick button too early and the hammer will appear to be coming out toward you instead of down the field. * If you don't press the joystick before the thrower steps out of the circlr, he'll be literally lifted our into the air! * If the thrower spins too closely during the revolve stage, he will wrap the hammer around himself. 1. Press the SPACE BAR (or a joystick button) to start the game. 2. Press and hold down the SPACE BAR (or a joystick button) to go into a 'get set' position. An official's arm with his gun ready to fire appears. 3. Release SPACE BAR (or a joystick button) when the starting gun fires. If you release too soon, you commit a 'false start'. After three false starts you are out of the race. 4. To increase your speed, press the LEFT and RIGHT arrow keys (or move the joystick left and right) as fast as possible. The faster you alternate the keys (or the joystick), the faster you will run and the further you can jump. 5. When you approach the hurdle, press the SPACE BAR (or a joystick FIRE button) to jump. Note: If you jump too soon or too late, the runner will stumble over the hurdle and be disqualified if he falls down. If you hold down the SPACE BAR (or joystick button), you'll get a longer jump, but you'll fall more easily. 6. After you jump all of the hurdles, you dash through the finish line. The competitors with the lowest time is the winner. During a race, you may knock down an unlimited number of hurdles without disqualification although your time will be increased. You are disqualified if you trip and fall over a hurdle. 1. Your opening screen will show a pole vault mat. The height you are attempting in your vault appears on the score board. Press the UP or DOWN arrow key (or move the joystick handle up or down) to move the bar to the proper height. 2. If you're in practice play, raise or lower the bar height to any level you want. If you're in competition play, you cannot place the bar lower then the height of the last successful record. During competition, you'll have three attempts to make the height you've selected and you cannot select a lower height during those three attempts. Note: If you've made a successful vault on one of your attempts, you won't be entitled to any more attempts for that round. 3. Press the SPACE BAR (or a joystick button) to race towards the uprights. 4. Press the LEFT and RIGHT arrow keys (or move the joystick handle left and right) in time with the contestant's feet in order to increase his speed. 5. As the contestants gets nearer to the uprights, press the DOWN arrow key (or move the joystick down). This lowers the pole into the ground and causes the contestant to be lifted toward the top of the uprights. Don't hold DOWN too long as this will cause the pole to snap. 6. As the pole bends and lifts your contestant over the bar, press the UP arrow key (or move the joystick up) to lift his feet over the bar. 7. Lift and twist your contestant's body over the bar by pressing RIGHT arrow key (or by moving the joystick to the right). He will fall to the mat, either cleaning the bar, or knocking it off, depending on how successfully you executed these steps. 8. Press SPACE BAR (or a joystick button) to clear the screen and bring up the next contestant. Note: If you're in competition play, the next competitor will be prepared to jump. Repeat steps 1 through 8. Competition will continue until all but one of the contestants have failed to clear the bar during threee attempts. In order to win you must achieve the greatest height. It is deemed a fault if the competitor knocks the crossbar down, fails to leap over the crossbar or breaks the pole. 1. Press the joystick button to start your approach to the mount. 2. Move the joystick up or down. In the up position, you go into a straddle mount, while in the down position an extended body mount to a lower bar handstand will result. You are scored on execution of the moves as well as one of four levels of difficulty for each move, ranging from 'A' for easy to 'D' for most difficult move. Consult the three diagram to determine your desired sequence of moves and follow these instructions. 1. For each move (except for the mount) move the joystick up or down or to the centre position. Note: You can prevent the Hip Circle Hecht Turn Dismount by holding the joystick button as you execute the move. 2. The centre position will usually produce a hold position or a swing movement. 3. During the dismount, press the joystick button, just before the gymnast's feet touch the floor to prevent any penalty for stumbling. Note: You have two minutes to complete the exercises. If your gymnast is still performing when time runs out she will fall to the floor. * The average difficulty of the moves. * Composition (there must be at least one but not more than three moves from each group). * Technical requirements for the moves (for instance, did the contestant change smoothly between bars or change the direction faced in moving bar to bar). You work with the two bars in continuous action as you move from high to low bar and vice versa. You are not allowed any stops and no more than four manoeuvres in a row on one bar. You must also make a minimum of ten moves. 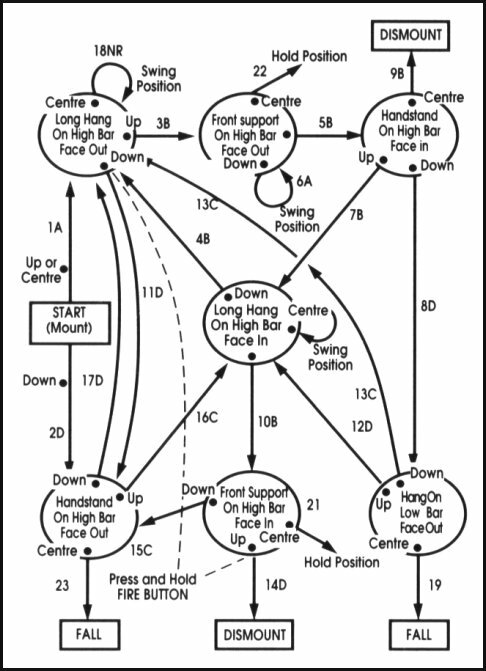 Excep for swings, bar holds, or falls judges will rate each move in terms of level difficulty. The table following summarises the levels of difficulty for each move. This point evaluation tables gives you a perspective on points made and lost. 1. The opening screen shows the gymnast hanging from the rings. You have two move possibilities. * If you quickkly strike LEFT and RIGHT ARROW keys or move the joystick handle left and right, the gymnast will go into a front lever position. * If you quickly strike the UP ARROW (joystick handle up and down), the gymnast enters a straight arm hang position. 2. Choose your next series of moves from the the tree diagram. There are a large number of moves you can make, each with its own level of difficulty. There are also 11 different hold positions you can make. 3. Each time you go to a new hold position on the rings, keep that position for two seconds before moving on to a new position. To do this, repeatedly move either LEFT and RIGHT or UP and DOWN, depending on your last move to achieve that position. * If you fail to move the joystick at the minimum level necessary to maintain a hold position, the gymnast will fall. * If your joystick movement is above the minimum necessary to prevent a fall, but below the optimum necessary to maintain a hold, the gymnast will exhibit muscle tremors and shake. * There are three lights at the top of the screen. If you maintain your hold position for two seconds, the left light comes on if you scored an "A" level in difficulty, the central light if you scored a "B", and the right for a "C". There is also an accompaying low, medium or high tone sound. When you see the light and hear the sound, go to another move to avoid being penalised for maintaining the hold too long. The icons arranged along the lower part of the screen represent all eleven moves possible. A flasing icon shows the move you are currently doing. When the move has been held for the correct amount of time (approx 2 seconds) a tone will sound, the icon will cease flashing and be left in a non highlighted state (dark blue shadow). You should now go on to another move to avoid being penalised for maintaining the hold too long. During practice there is and additional help mode available (HELP key toggle on/off). This takes the form of a highlighted border around the icons. A vertical highlighted border means that key/joystick movement up and down will take you into this move, likewise for a horizontal highlights key/joystick left and right movement. Note: If you score less than 1.0 in difficulty, your execution score will be penalized. Execution is based on how well each move is accomplised. Each time you exhibit a muscle tremor or hold position for too long or too short a time, you lose points. A fall automatically results in zero execution points. To score in Virtuosity (i.e. doing better than expected) you must have a perfect execution score. Each move has its own difficulty rating, being either 'A' (easy), 'B' (medium) or 'C' (hard). To achieve the maximum score possible for difficulty you must have two 'A', three 'B' and three 'C' moves in your routine. 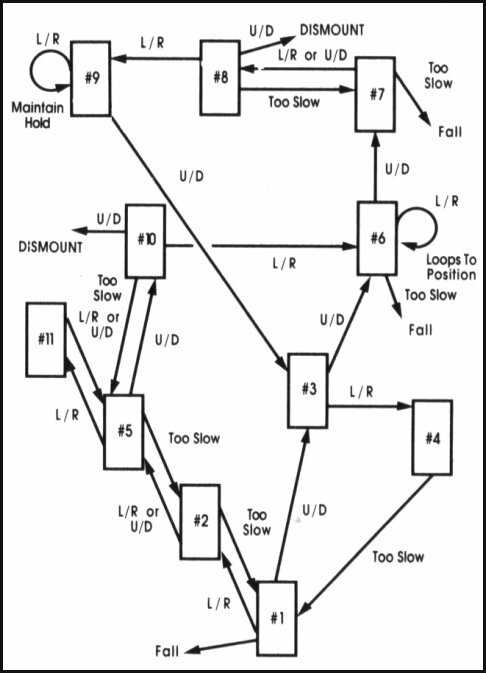 The following moves give an indication of possible Difficulty scores. If you substitute a move of greater difficulty for one of lesser difficulty, you would earn a higher execution score. For instance, if you have one 'A' move, two 'B' moves and five 'C' moves, you would still earn 3.4 points for difficulty but you'd earn a higher execution score. Combination and originality scores are dependant on one another. A high Combination score will also result in a high originality score. The reverse is not true, however, since excessive duplication of moves lowers the Combination score but not the Originality score. Your score for originality is based on the number of different sequences included but not on how often they are duplicated. You will earn 0.1 point for Risk for holding a left hold or shoulder stand for two seconds.